For a lot of dog owners, a nicely fenced backyard where your pup can roam, sniff out interesting things, and snooze in the shade is a must. It’s perfect — except when your dog believes the grass is greener elsewhere, and he becomes a master escape artist. One minute you see him from the kitchen window, the next he’s gone. Along with worrying about his safety, it’s frustrating to know you can’t trust him even in your own backyard. Don’t despair; there are some relatively simple things you can do to keep your canine from escaping the yard. Your dog may decide to roam because he’s lonely out there. As nice as it is to have all that open space, he may prefer your company or just be looking for a friend. A territorial dog may see something outside his boundary that he thinks threatens his home, so he needs to get out there and ward it off. Maybe’s he’s found “treasure” on the other side: a new friend to play with, food, an enticing stream of water, or a big field to run in. And, of course, there are the prey-driven hunters. A mere fence won’t keep them from chasing a squirrel or rabbit that just ran through the yard. He may just be a puppy or an adolescent who requires more outlets for his incredible energy. Different dogs have different ways to escape. Some are jumpers; they take a running start from the ground and over they go. Some use whatever is near the fence to climb up, and then over they go. Other dogs are diggers, burrowing tirelessly on their way to freedom. Then there are the chewers who can make a hole in the fence large enough to slip through. The deep thinkers may figure out how to actually open a gate. Some dogs rush the gate whenever it is opened and dash out before you can catch them. Especially determined dogs will use a combination of these techniques. Although it may sound counterproductive, you should take your dog for a walk every day, even if you have a nice fenced-in yard. The great physical and mental exercise that comes with a walk may help your dog use up some of his energy and keep him from being bored when he’s in the yard. Extend your fence. You don’t necessarily have to make it higher, but adding a section to the top that tilts inward will deter your dog. A lean-in or L-footer will do the trick. You make a lean-in by taking some farm wire and attaching it to the top of your fence, so that it creates a sort of awning on the inside. Your dog will see fencing above him and that should deter him. An L-footer extends horizontally from the top of the fence and also creates an awning-type deterrent. Remove climbing aids. Walk around the yard and take note of anything close enough to the fence that can be used to climb on: a wood pile; garbage can; children’s slides or playground equipment; even a bench, chair, or boulder. Buy a coyote roller. These are long, metal bars that can be attached to the fence to prevent your dog from getting the foothold he needs to get over. When an animal tries to use it to gain footing, it rolls like a rolling pin. Designed to keep coyotes out, they’re equally effective for keeping a beloved pet in. They do require mounting brackets and end caps, but you can find complete kits online. Add landscaping. Plant a hedge of dense shrubs along the inside of the fence line. Not only does this make for a more difficult jump, it looks great, too. Attach an L-footer along the bottom of the fence, facing in. You can use chicken wire, hardware cloth, or a piece of chain-link fence attached to the base of the fence. Some people bury it for aesthetic reasons. But you can also lay it on top of the grass and hold it down with rocks, gravel, mulch, or even planters. Pour a concrete footer. This will stop even the most determined digger. Pour concrete along the perimeter of the fence and sink the bottom of the fence into the mixture. Block the view. For a watchdog, guard dog, or any dog that patrols his territory, it’s often the sight of “danger” that propels him out of the yard. If you have a chain-link fence, run plastic slats through it. With any type of fence, rolls of bamboo or reed fencing are a relatively inexpensive alternative. Just use zip ties to attach it to your existing fence. It blocks the view and doesn’t look half-bad. 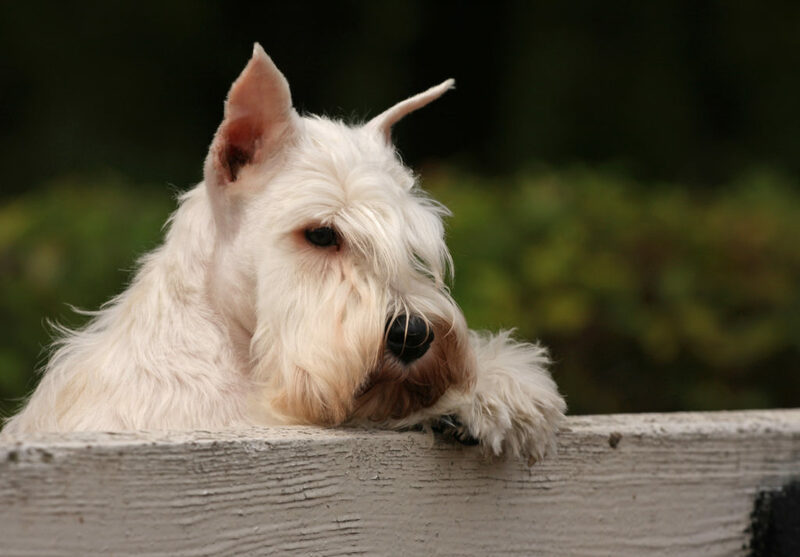 While this takes longer to be effective, you can also plant climbing shrubs or vines along the fence, though you’ll have to protect them from the dog until they’re established. No matter how your dog escapes the yard, there are several other measures you can take to ensure his safety. If you have a gate that’s often opened or left open by accident, install an airlock or double gate. Take a few lengths of fence and another gate and create a small, enclosed area inside or outside the fence. When someone wants to get in or out, he or she will have to go through one gate, close it, and then open the second gate. Get your dog a Puppy Bumper. This is a collar stuffed with fiberfill that’s meant to keep puppies and small dogs from slipping through small openings. Make sure all the latches on gates and fences are secure. If you have a gate that blows open or a latch that doesn’t stay shut, add a lock or hook-and-eye closure. Make the yard his happy place. The backyard shouldn’t be his prison; it should be his haven, shelter, and playground. Make sure he has plenty of fresh water and some shade. For fun, bring out a treat-dispensing toy. Rotate your dog’s toys to keep him interested. Don’t leave him alone out there for long periods of time or any time when you can’t supervise him. The very best way to keep him in the yard is to be there with him. Play fetch with him, brush him, use it as training time, or just hang out. He’ll be less interested in leaving if his best friend is there, too! If you’re away from home, keep your dog safe inside, so he won’t escape to go looking for you or get taken out by someone else. If your dog does escape from the yard, it’s important to remember that you should not punish him when you find him or when he comes back. This will not eliminate his desire to escape, and it may make him afraid to return to the yard.